The Magnificent Seven returns to much-needed territory of Western heroism. There's a school of thought that remakes are a plague upon filmmaking, part of a desperate fear of risk-taking that encourages recycling proven concepts. And there is a smaller school of thought that tempers such justifiable criticism with the caveat that a remake might be acceptable if it does something radical and daring with the original premise. But allow me to make the case with The Magnificent Seven that there might be another defense: What if a remake simply served to give us back a kind of movie we've forgotten how to appreciate? It's fair enough to note, of course, that director Antoine Fuqua's new version of The Magnificent Seven isn't even remaking something that was original itself, since John Sturges' 1960 film was an American re-telling of Akira Kurosawa's 1954 Seven Samurai. But the 1960 Seven represents a brand of classic cinematic Western that has more modern resonance than we might realize. Whatever it might leave on the table in re-visiting this story, maybe this version tells us something we need to hear. The basics of the story have changed very little. There's still a town under siege from a ruthless bigshot—in this case, mining boss Bogue (Peter Sarsgaard)—and his personal army of enforcers. There's still a seemingly hopeless mission by the townspeople—represented by widowed Emma Cullen (Haley Bennett)—to hire men willing to accept the likely suicidal job of protecting them. And once one man—bounty hunter Sam Chisolm (Denzel Washington)—agrees to assist, there's a gathering of an additional six: gambler Joshua Faraday (Chris Pratt); sharpshooter Goodnight Robichaux (Ethan Hawke); knife expert Billy Rocks (Byung-hun Lee); wanted criminal Vasquez (Manuel García-Rulfo); Indian tracker Jack Horne (Vincent D'Onofrio); and Comanche warrior Red Harvest (Martin Sensmeier). That's something of a shift from the alpha-male casting of the 1960 version, which is closer in modern equivalence to The Expendables. The script—perhaps not-coincidentally co-credited to The Expendables 2 screenwriter Richard Wenk, along with True Detective's Nic Pizzolatto—tosses out a few bits of back-story for our reluctant heroes, including hints at Chisolm's own history with Bogue, and Civil War PTSD shaking Robichaux's confidence. There's still some charisma in individual performances, particularly Pratt's devil-in-his-eye Faraday and Sarsgaard's oily conviction as the villainous Bogue. 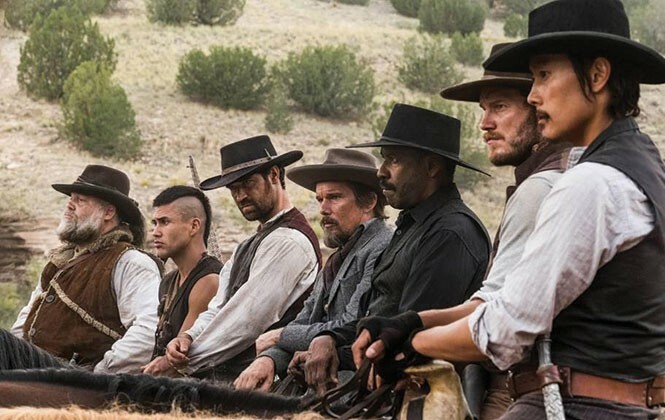 In general, though, this Magnificent Seven doesn't seem particularly interested in plumbing psychological depths, which is a bit of a problem when scenes where characters' lives hang in the balance don't seem to have earned our concern over who will live and who will die. Yet there's a throwback vibe to everything that goes on in The Magnificent Seven that somehow makes even superficiality feel like part of a plan. This is the kind of movie that introduces its cowboy protagonist riding in silhouette against the sun, and has him walk into the town saloon with a presence that hushes the rowdy patrons and silences the tinkling of the piano keys. A scene like that—complete with Pratt checking out the cards of his fellow poker players after they flee the premises—might have played as a ridiculous Western cliché, but Fuqua embraces this iconography. As a director of action, he's a meat-and-potatoes guy, which helps a lot when nearly the entire final hour is dedicated to the climactic siege on the town. But he also understands how effective it can be to have the final conflict come down to two men facing off at opposite ends of a dusty street, with their hands on their guns. This is a story not just about Good Guys vs. Bad Guys, as it plays out, but about people willing to stand up for what is right. It might be tempting to attach the now-familiar "revisionist Western" label to this film because of the ethnic diversity of the heroes, and there are satisfying tidbits in the script about how these men who could easily be enemies instead choose mutual respect and a battle against a bigger threat. Maybe that's the part of this tale that needs telling in this world. As Elmer Bernstein's rousing, legendary Magnificent Seven theme plays over the closing credits, it doesn't feel like a reminder of the movie you're not seeing; it's a reminder of the kind of stories, about proud people fighting for justice instead of personal gain, that we wish didn't seem so old-fashioned.